Yeah you read it correct. Finally I did a completely paper free vacation – well sort of. I did my part, but there are many contracts and agreements which are still printed out. It has been years now that smart phones have become popular and common. But if you look around, everyone carries a bunch of paper during travelling – Boarding passes, hotel confirmation, rental car confirmation , destinations. The list goes on and on. Well I am not complaining, till last vacation I did that too ! And I am not saying that its less efficient nor everyone need to be a geek. The purpose of this is just tell you all that it is possible for a paper free trip. So lets look at what do you need. The basic necessity – smart phone and some apps ( A bunch of friends and a plan too 😀 ) . I must say that every individual plans their vacation differently, and so the requirements will differ from person to person and even trip to trip for same person. Trip It ( Free ) – This app is awesome. Basically you integrate this to you Gmail, It polls your email and finds almost all confirmations ,parses it and find all relevant information and presents to you in an easy and readable format. 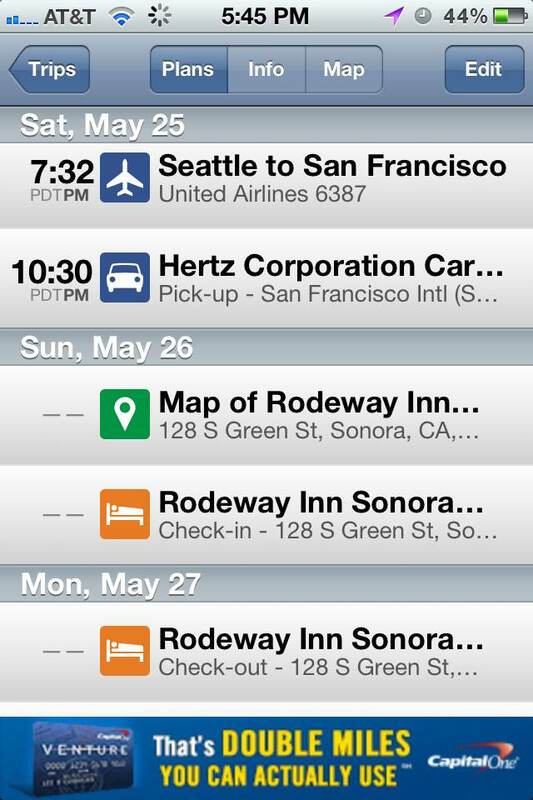 It can find your flight itinerary , hotel confirmations, rental car confirmations etc. Another cool feature is that it stores locally so that you don’t have to worry about cell phone reception. Gmail ( Free ) – This is a fall back app ( in case Trip it fails ! ) that will have almost all of your confirmation emails in one place. And I did use for another purpose this time. We were driving extensively in Yosemite National Park and Hwy 395 to Lake Tahoe. Not surprisingly I did not anticipate cell phone coverage in those remote places. Gmail Drafts is a good option to save some of these emails. ( Gmail caches emails but it has a offline storage limit ). 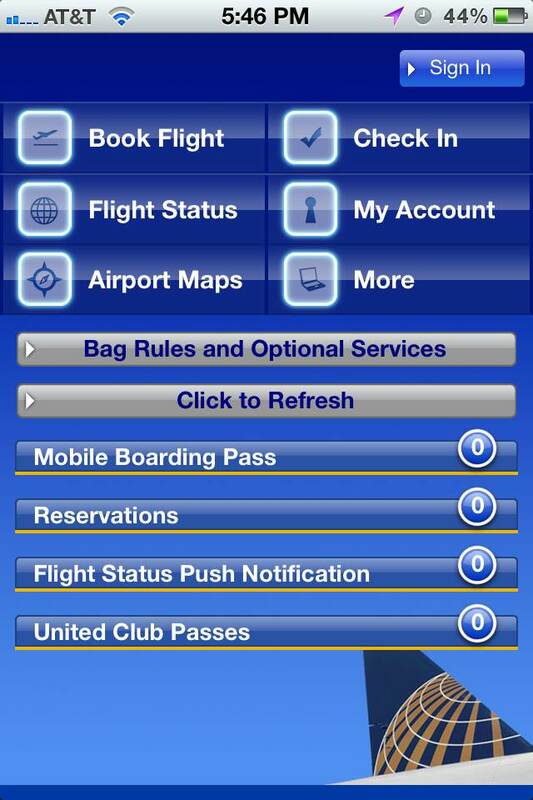 United Airlines App ( Free ) – I love United’s mobile boarding Pass ! It is a mobile QR code that can be screened at TSA as well as the gate. This app has let me check-in exactly 24 hours before departure because I can immediately check-in when I receive the email . The flip side – United’s gate did not have QR code scanner at SEATAC, the gentleman at the gate had to key in the last name to board me. The flip side – No offline support (iOS). I relied on my Tom Tom for Navigation. But I did realized that if you are travelling to Yosemite and not planning any out of ordinary – then you could rely on the direction boards and little bit of memory on which Hwy to take. Yelp (Free) – For finding restaurants this has been my go to app. I have been trying to change my preference to Google powered Zagat, but habits are hard to change. Google Now (Free) – New addition to the list. I found that Now can be helpful when you really need it! When I was returning to Seattle I was to board the flight at San Francisco International Airport. I was running late and was driving from San Jose to SFO. I was rushing and boarded the Air train ( from Rental Car Counter to Terminals ) without knowing which terminal or which Gate I was supposed to go. I figured this is a time to test Google Now and It told me the Terminal to go and the status of my flight . Unfortunately it did not tell me which Gate I am supposed to take, generally It used to be pretty accurate with gate information . The flip side – You need cell phone reception for this app to work. I have found that it never caches cards locally ! So next vacation , try be a geek !